In late June I traveled to Tanzania mainly for leisure, but also to become more familiar with the geographical area I am studying at the Sorbonne in Paris. I am a graduate student and my PhD research focuses on nineteenth-century British exploration in relation to the sources of the Nile. 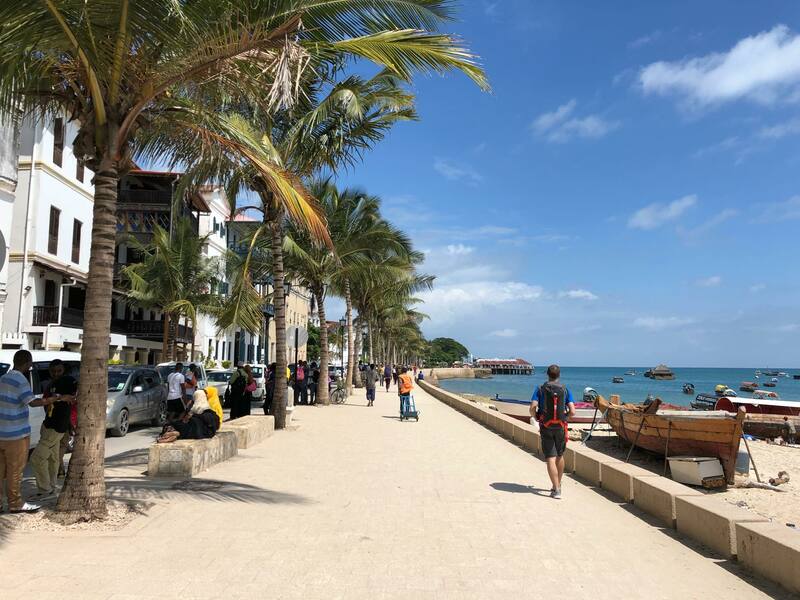 The first part of my trip took me to two places on the coast – the town of Bagamoyo and the village of Kaole – as well as to Stone Town, which is on Zanzibar’s main island Unguja. These places are linked historically with the world Livingstone and his contemporaries encountered. This trip was a good opportunity to explore and consider western representations of “Africa.” In particular, as a student specializing in British expeditionary literature in East Africa, I felt it important to compare the impressions I previously had while reading historical accounts and popular fiction with what I would experience on the spot – not just in order to correct wrong assumptions I might make about present-day Tanzania, but also to gain a sense of the country’s prevailing cultural influences. Guillaume Didier (right) walking on the promenade in Stone Town. Copyright Florian Berret. CC BY-NC 3.0. Another of the main purposes for this trip was to look for evidence, historical data, and artifacts from the precolonial era, especially on the coast and in Zanzibar. In particular, I had an eye out for anything related to Arab-Swahili slave traders and British explorers. Livingstone Online director Adrian S. Wisnicki also advised me to make initial inquiries about relevant archive materials in the area and to reach out to scholars working in Tanzania who might know more. Although the timeframe of my trip did not allow for extensive archival work, what I discovered is that few, if any materials from before the German colonial period are held in the Tanzania National Archive, but that there may be a few documents related to the explorers in the Consular Archives in Zanzibar. When I first arrived in Dar-Es-Salaam, the largest city in Tanzania, the streets felt noisy, warm, and dirty; not quite as charming as the villages along the coast would be later on. I did not feel as alienated by what I saw or heard as I had thought I would be. I was certainly expecting more of a cultural shock. What struck me initially was the contrast between the run-down look of several buildings in town and how careful people on the streets were regarding the clothes they wore. Despite the heat and the dust, people tended to dress elegantly. Many men wore full suits whereas I was already feeling very hot while wearing only a T-shirt and shorts. After landing in Dar-Es-Salaam, a bumpy bus ride took me to Bagamoyo. Shortly after my arrival at my guest house, I walked to the beach and soon spotted many dhows. In the nineteenth century, these small ships were used to carry slaves, ivory and other merchandise between the coast and Zanzibar. Today dhows are still used by local fishermen. 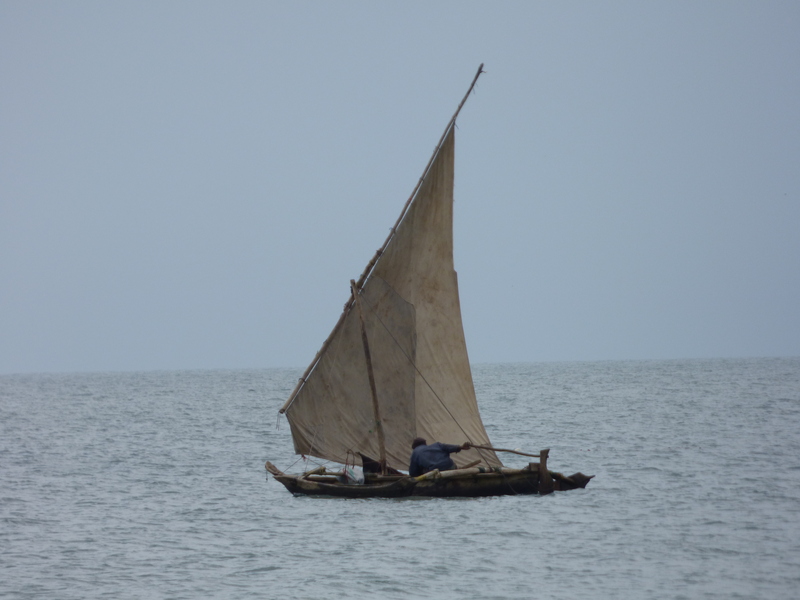 Dhow off the coast near Bagamoyo. Copyright Florian Berret. CC BY-NC 3.0. Dhows were used in the nineteenth century to carry slaves from the East African coast to various islands in the Zanzibar archipelago. Today they are still used across the Indian Ocean to carry merchandise such as fruits, water, or spices. After settling in, I walked over to Kaole, about an hour and a half away by foot, and took in the sights of the nearby country while meeting locals along the way. As I left Bagamoyo, I passed by the College of Arts, where students are taught traditional Tanzanian painting, sculpture, drama, dancing and drumming. It was the end of the afternoon and getting dark when I finally reached my destination. I had but a glimpse of the ruins of a thirteenth-century mosque which dates to a time when the Sultan used to rule this part of the Tanzanian shore from Kilwa, as well as another mosque from the fifteenth century. A few more steps took me towards the sea, where the mangroves had become completely overgrown and blocked the view. Here I encountered a panel the signaled the place as that of the old port of Kaole and mentioned Livingstone as well as Richard Burton and John Hanning Speke, two other British explorers that were Livingstone’s contemporaries. 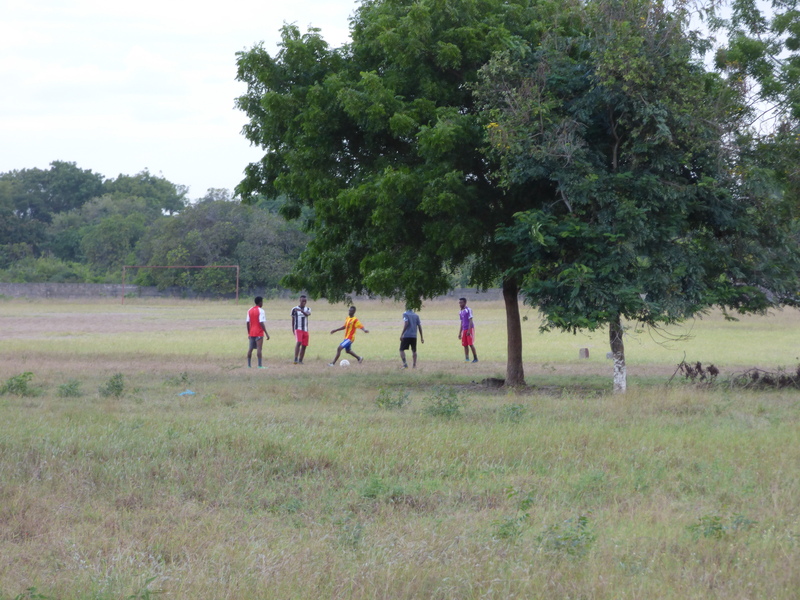 Local boys playing football near the village of Kaole. Copyright Florian Berret. CC BY-NC 3.0. Football is very popular throughout Tanzania and is often an occasion for young men to socialize. Both Kaole, as a historical site and local village surrounded by the bush, and Bagamoyo reflected my expectations. The dhows, the mosques, the red soil, the colorful, exotic bird species, the crocodile and snake farms I had visited on the way to Kaole . . . all these contributed to creating a picturesque and ancient feel to the area, a far cry from Dar-Es-Salaam, which felt much more lively and modern. That said, such impressions can be conveyed by many new locations and are not specific to Africa. Moreover, some aspects of local life, in contrast, did feel more modern, such as the College of Arts, the occasional motorbike, and the bus station. I had also expected to find more evidence related to historical explorers than one or two signposts – for instance, I had hoped to see pictures and maybe biographical signs. This point led me to consider the limited extent to which these figures might be relevant to modern local culture in East Africa. On the next morning, before leaving Bagamoyo, I visited the old German boma. In Kiswahili the word boma may refer to various types of fortified building. It was also the word used by Germans to refer to the colonial office in Bagamoyo. The town used to be one of the most important trading ports on the East African shore and was a step for expeditions coming and going from Zanzibar to Lake Tanganyika. As explained by Hussein, my guide on this day, Bagamoyo means “Lay down the burden of your heart,” a reference to slaves having to forget the lives and family they used to have in the interior once they arrived on the shore. From 1887 to 1891, Bagamoyo was the capital city of German East Africa. Tensions between westerners and Arab-Swahili populations arose when the Sultan of Zanzibar and local chiefs were forced to yield lands to the German government. This led to the Abushiri revolt, which spread along the shore and in which several German representatives in East Africa were killed. Abushiri, the leader of the revolt, was eventually caught and hanged in public in Pangani where the revolt had first started. Old German boma, in Bagamoyo. Copyright Florian Berret. CC BY-NC 3.0. This boma was built by the Germans in 1888. Although it has undergone renovation work several times and can be visited, it has been left completely empty and is uninhabited. Pangani, which lies north of Bagamoyo, on the other side of Saadani National Park, used to be an important center of the slave trade. 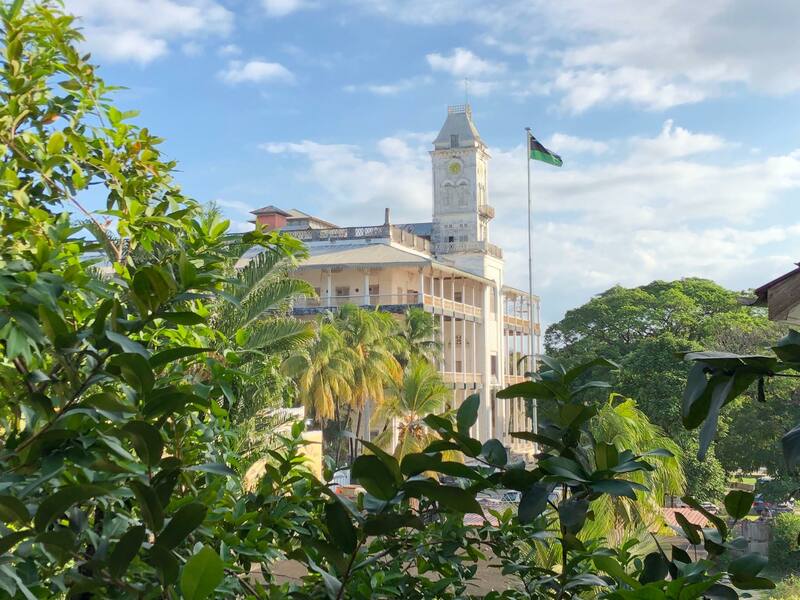 When the trade was forbidden in 1873 through treaties signed jointly by the Sultan of Zanzibar and Great Britain, Pangani became a strategic place for the smuggling of slaves to nearby islands in the Indian Ocean. During my visit, Hussein pointed me in the direction of “Livingstone Church,” where I next stopped. There are two churches in Bagamoyo: the Holy Ghost Mission Church, which is a Catholic Parish Church, and the “Livingstone Church” which is an Anglican church. Bagamoyo’s website mentions that the Anglican church was built in 1974, a point that indicates that David Livingstone never actually visited this church. That said, all accounts seem to agree on the fact that Livingstone’s body was housed near the Holy Ghost Mission Church after Susi, Chuma, and others had carried his remains to the coast in 1874. The Livingstone Tower, next to the Catholic mission building, commemorates this fact. Whether this commemoration of the missionary enterprise (via Livingstone in this case) partakes in furthering imperialist rhetoric about the need to “emancipate” East Africa from slavery is hard to say. What should perhaps be stressed is that such a figure as Abushiri, who decided to oppose changes to the slave trade imposed on the locals by the early German colonial administration, is equally remembered – glorified even – by the local guides. This creates an interesting paradox, as conflicting histories seem to blend in effortlessly with each other in local memory here. This is certainly worth further consideration. First sight of Zanzibar from the ocean. Copyright Florian Berret. CC BY-NC 3.0. Both the Sultan’s Palace and the House of Wonders can be glimpsed on the seafront, along with more modern buildings. I left Bagamoyo in the afternoon and next visited Zanzibar. Some of the island’s historical buildings could be seen from the ocean, especially the House of Wonders (a.k.a. Beit-al-Ajaib) as well as the Sultan’s Palace (a.k.a. Bait As-Sahel). 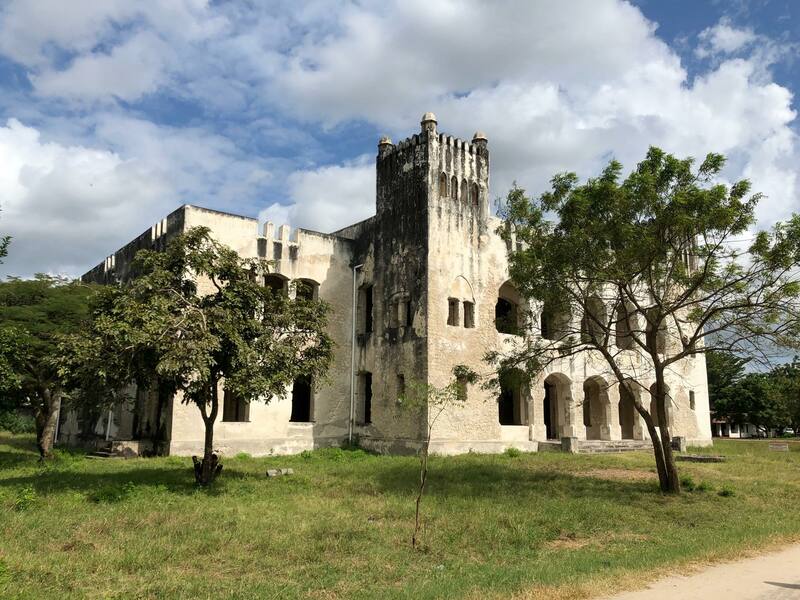 That these buildings are still standing today testifies to the ongoing, difficult, and expensive conservation efforts led by Zanzibaris and Omanis to save them from destruction. It also indicates that some Zanzibaris are sensitive to the cultural and historical inheritance on the island. 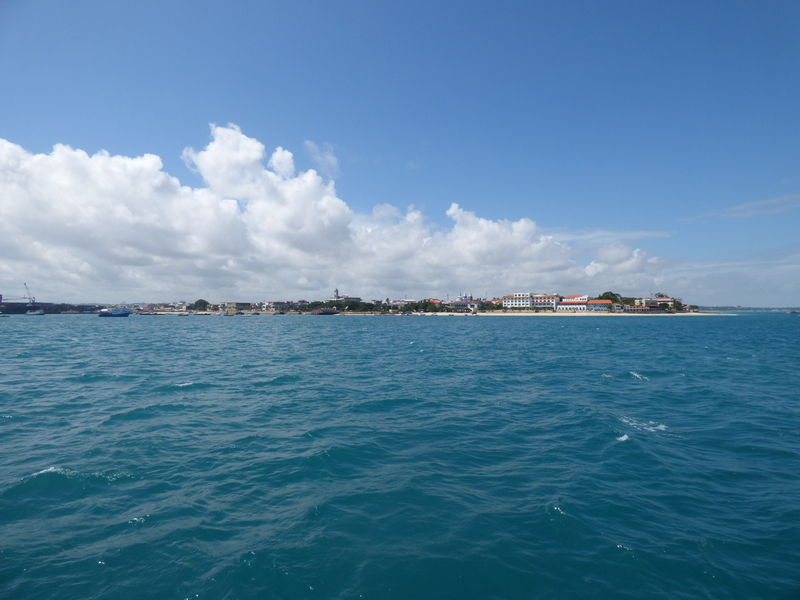 In the afternoon, once I had settled down, I decided to walk around Stone Town. I visited slave cells, not far from the ancient slave market, where Christ Church, an Anglican Cathedral, now stands. As my new guide David explained, the altar was built near the place where the “whipping post” used to be. 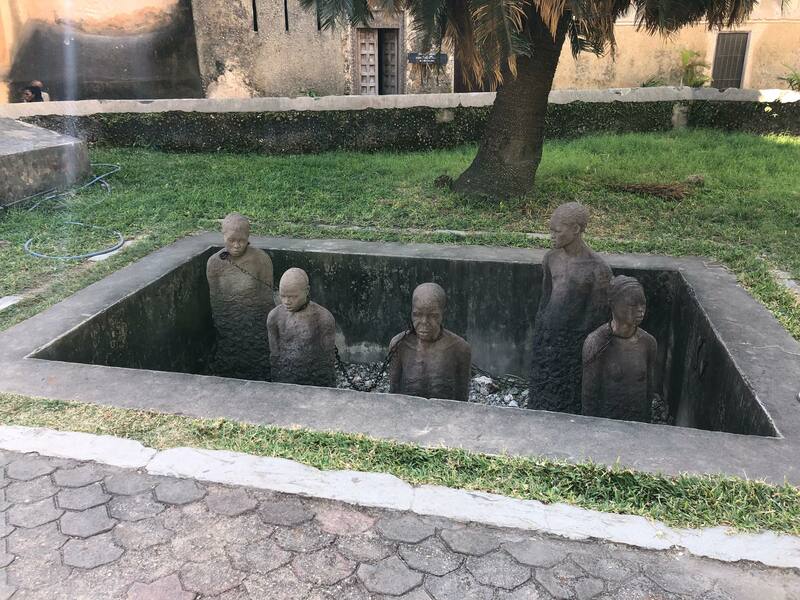 There is a memorial to the victims of the slave trade just in front of the church and a few artifacts related to Livingstone inside the church. Slave memorial in front of the cathedral. Copyright Florian Berret. CC BY-NC 3.0. Visiting the slave memorial near the place where slave auctions were held in the nineteenth and earlier centuries was a powerful experience for the author of this piece. It reminds one of the violent exploitation of many men, women and children that took place on this site in a rather graphic way. Unlike the chains in the former slave cells (located in the underground nearby) which are mere replicas, the chains displayed on the memorial are originals and were used on slaves in the nineteenth century. Near the altar, one can see Livingstone Cross, which is described as a “crucifix made from the wood of the tree under which Dr. Livingstone died at Chitambo village, Ilala, Zambia in 1873, and under which his heart is buried.” The crucifix was presented to the Diocese of Zanzibar in 1901. Guillaume Didier (right) and his local guide David in front of Christ Church. Copyright Florian Berret. CC BY-NC 3.0. The cathedral was built on the site of the slave market and is mostly made of coral stone. Coral-stone buildings in Stone Town present specific renovation issues. 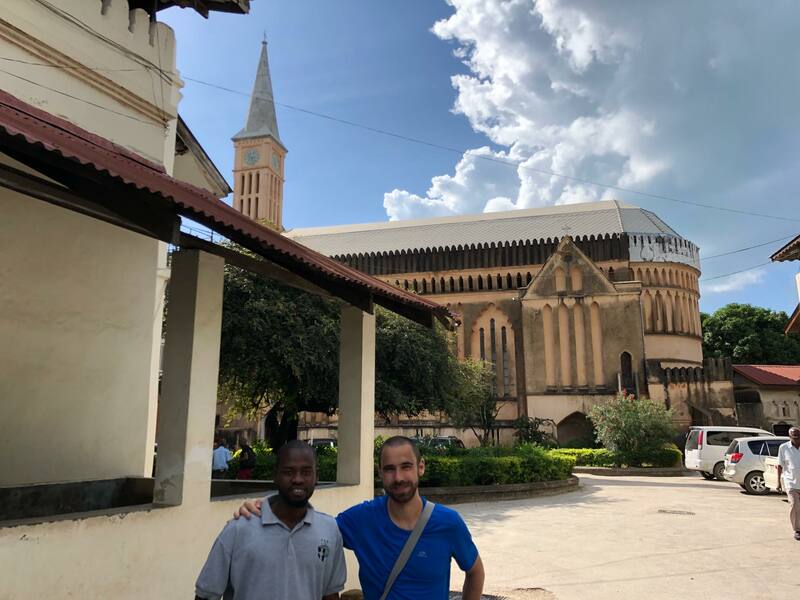 Besides creating an opportunity for the guides to support themselves by offering tours, the tours also enable the guides to share their personal views on Zanzibar and East African history. After this visit, I had a look at the East African Slave Trade exhibit, which appears just above the slave cells and where one can read biographies of influential slave traders such as Tippu Tip or Mirambo. Born on Unguja, Tippu Tip was the most powerful trader in central Africa during the last half of the nineteenth century, as well as a leading supplier of ivory. Mirambo was a warlord dealing in slaves and ivory who dominated the trade caravan routes from Tabora to the east of Lake Tanganyika and, notably, opposed the Zanzibari allies of Henry M. Stanley. I also saw very old photographs of slaves and porters and read a copy of the telegram sent by John Kirk, British Agent at Zanzibar, to the Foreign Office “reporting that a treaty prohibiting the sale of slaves [had] been signed by the Sultan of Zanzibar and the closing of the slave market in Mkunzini. June 5, 1873.” Livingstone’s account of the Nyangwe massacre, during which Arab slavers shot many local individuals in Central Africa, led British authorities to put increasing pressure on the Sultan to shut down the slave market in the archipelago. Finally I visited the Sultan’s Palace (a.k.a. Beit-el-Sahel) where I saw portraits of the Sultans Seyyid Saïd, Majid, and Barghash as well as their tombs since the terrace overlooks the Sultans’ graveyard. I closed with a stunning view of the Bay of Zanzibar at sunset. The House of Wonders, a.k.a. Beit-al-Ajaib. Copyright Florian Berret. CC BY-NC 3.0. The building’s exhibit was actually closed due to renovation works, but is scheduled to reopen soon. The experience of my first four days was extremely pleasant overall. That I could discover so many elements relevant to my research merely by walking around illustrates both continuities and developments in material history rather than a fixity in time. From an intellectual standpoint, the main consequence of the trip is that it has urged me to accept cultural differences for what they are, even when those contrast with western values. In my future research I hope to take the cultural relativism of such situations into account: approaching the history, cultures and societies of East Africa may best be done by seeking to understand the values inherent to these societies rather than by adopting a western mindset. Furthermore, Zanzibar’s modern paradox is that it does have conflicting histories and that historical buildings from very different cultures (the slave cells, the Sultan’s Palace, the House of Wonders, the memorial and the Church) coincide with each other in their geographical proximity. Stone Town, on the main island, is a testimony to these conflicting histories; but in the modern day, it results in it being a syncretic location. Finally, this experience has suggested that the historical figures I was tracking may not mean much to the average Tanzanian or Zanzibari in his everyday life, apart from occasional contacts he or she has with western tourists. Acknowledging this could be a first and interesting step towards a practice of cultural relativism in my research. 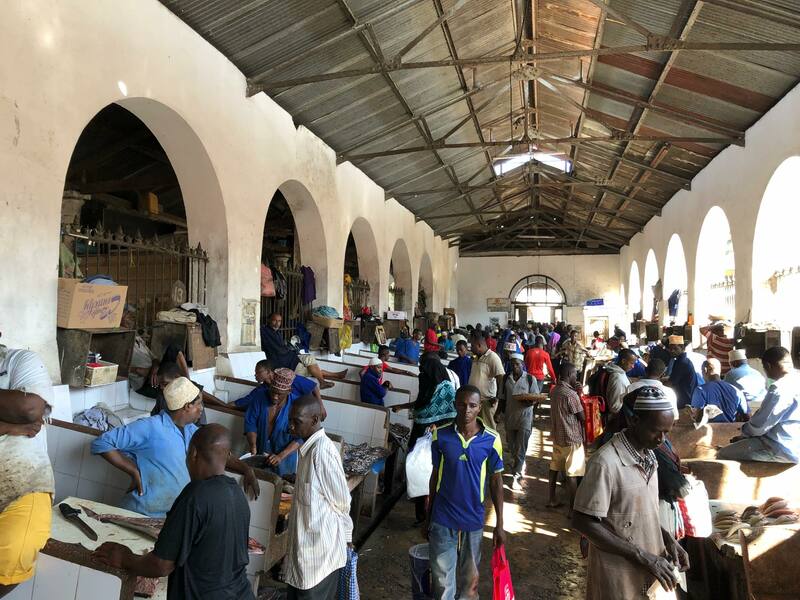 Local men in fisheries, Stone Town Market. Copyright Florian Berret. CC BY-NC 3.0. Other merchandise, such as spices and fruits, is traded from nearby stalls.